Files Encryption for Windows 10. USB Encryption. DVD Encryption Software. You will be redirected to new permanent homepage of this product www.cryptoexpert.com in 10 seconds. Current version is 7.8.3 October 11, 2008 . Compatibilty with Windows(R) Vista(R) 32 and 64 bit as well as XP 32 and 64 bit (Windows 2000 is also supported). CryptoExpert creates new virtual hard drives (K:, T:, Z: etc). It uses 256 bit encryption key to protect data on the virtual drive. 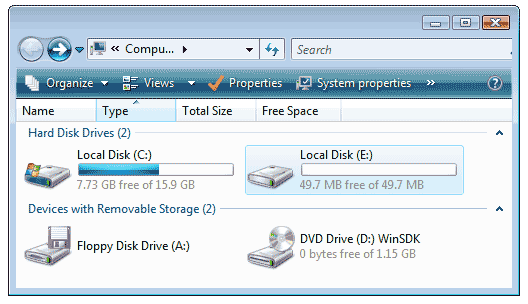 All virtual drive's are really located in one big encrypted drive image file. All you need is to enter password when you mount a container. For example, on the next screenshot you see the list of storage devices installed in our test system. There are one hard drive (Disk C:), one floppy drive (Disk A:) and one DVD-ROM drive (Disk D:). 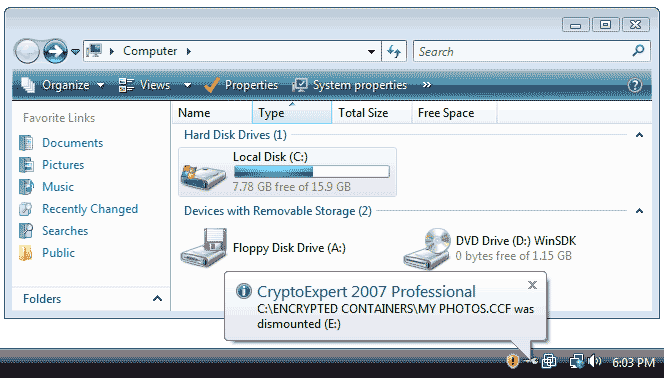 Now we'll show you how CryptoExpert 2007 Professional can help you to store all your private files securely. 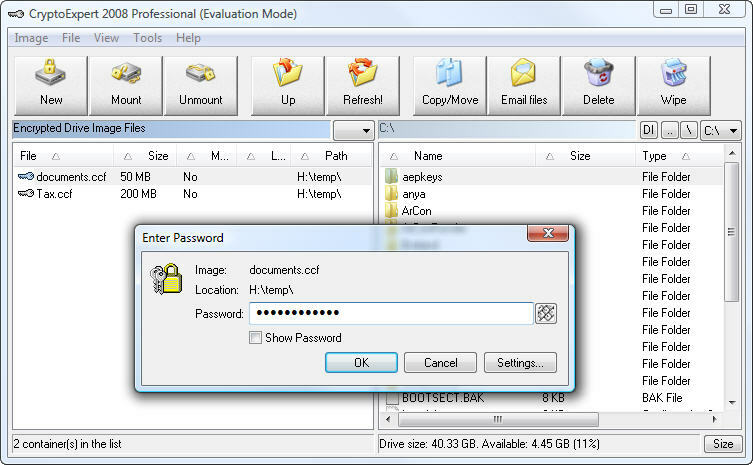 Assume, you already created several encrypted drive image files using CryptoExpert. Just see how it is easy to work with your documents and how fast is our real-time disk encryption software. Let's assume, your encrypted drive image files are located in C:\Encrypted Containers\ folder. 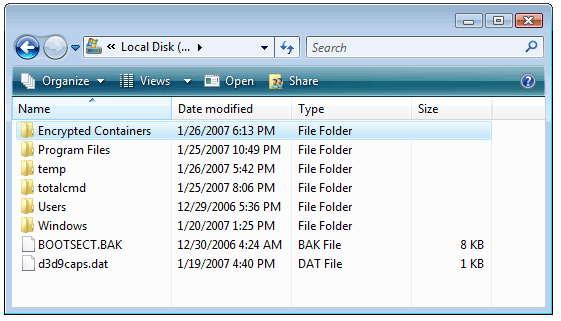 In the previous Windows Explorer window we click on Local Disk (C:). Now you see the root folder of your Local Drive C:. Now we go to C:\Encrypted Containers folder to see the list of encrypted drive images we created before. Please note, you can place your drive image files to any folder/any drive/even network drive. On the next screenshot you see two files. Every file is the encrypted image of virtual hard drive. For example, let's assume we want to look at private photos/edit or even move existing photos from a insecure place to the encrypted one. For this purpose we need to mount "My Photos" container. Click it by right mouse button to see the shell context menu. 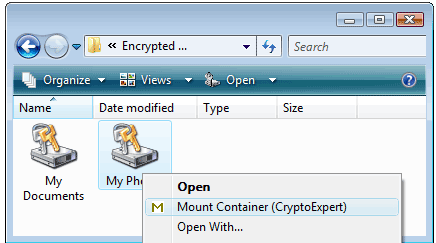 In the menu click Mount Container (CryptoExpert). You will be asked to enter a secret password. Just imagine, nobody can see your photos, financial documents and etc on this drive because only you know the right password. Done! Now you can see NEW HARD DRIVE IN YOUR SYSTEM! On the next screenshot the new mounted drive has name Local Disk (E:). Now you are able to work with files in the usual way as you do with files on any hard drive. CryptoExpert Real-Time encryption/decryption is so fast that you can even watch Movies located on this encrypted drive without speed degradation; Excel, Word, Photoshop, ACDSee, batch files in console mode - no limitations! Of course, you can copy/move/modify/delete any files to/from this hard drive E:. So, it is not read-only media. You can write encrypted image of hard drive (container) to DVD and send to your friend. 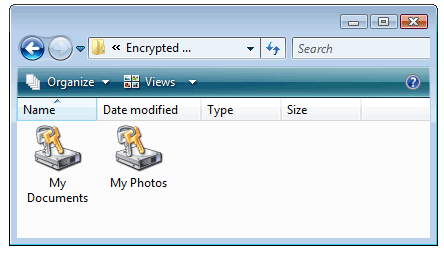 Assume, your friend has CryptoExpert and knows password for "My Photos" encrypted drive image file. Now we do not need to work with our private files anymore. To hide Local Disk E: just right click Yellow Key icon in Tray Notification Area, then choose Dismount menu item. Voila! Local Drive E: disappeared from your system! If you have any questions, do not hesitate to contact us: support@secureaction.com. All questions will be answered. Support for any kind of USB Flash Drives (including iPOD) as passwords storage for cryptoexpert's containers. No any backdoors are in used encryption algorithms! No access possible under any circumstances. If you do not remember the password you cannot access the encrypted contents. There is no special procedure, secret code, or hidden entry method to fall back on. - Lifetime technical support including support via e-mail. - FREE upgrade to new versions. - Product notification by e-mail. - Beta testing for newest version.